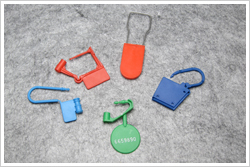 Plastic padlock seals are used for a variety of applications including doors, meters, inflight service equipment and tote boxes. Most seals are tamper-evident security seals to ensure ultimate protection. The Airline Padlock Seal is a self-locking, tamper indicating plastic padlock seal specially designed to secure in-flight bar trolleys and ATM cassettes. The Hasp Padlock Seal is a wire hasp, plastic body security seal that can be used in a variety of applications.